Ok, I know I am late again on this one. Due to the really nice weather around here this weekend the major focus was decorating. Had some new lights this year and actually got on the roof. Usually they only make it as far as the front porch posts. But it looks nice, still plan to add a woodworking project for next year though. But I did manage to get some time in the shop (even though my dw is still working on her pens) and finish off a few more pens during the week. 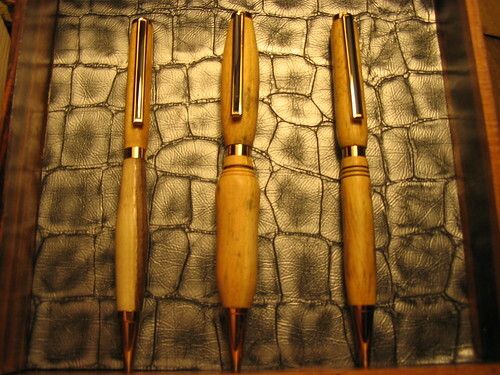 All made from Ficus with the exception of the bottom of the left one which is Black Walnut. Also made my first official non-standard slimline. Made from a European 7mm kit and Black Walnut. I like and have some work to do to get these ones looking really good. 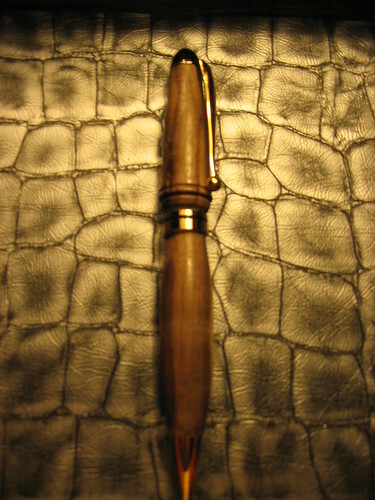 I am sure some one that turns can tell me the two problems I ran into in making this pen. One more project to get finished up and delivered this week. I’ll post the finished pics here on my blog and perhaps as a project.